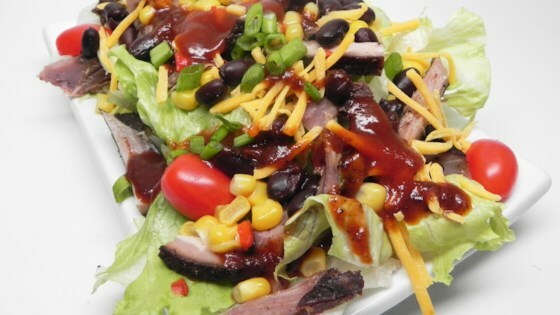 "Give your salad a kick with something different; using barbeque sauce as dressing makes this meal extra flavorful. We used leftover smoked pork made the day before." Combine lettuce, black beans, corn, pork, and tomatoes in a bowl. Add cheese; mix thoroughly. Drizzle barbeque sauce on top. Feel free to use your favorite variety of lettuce. For a spicy kick, add Marko's Spicy Drizzle sauce.